Stuffy is out, and stuffed crusts are in. As we continue our love affair with all things cheap, casual, and comforting, savory pies — both cloth napkin and paper varieties — fit the ethos perfectly. SF is rife with hearty crust-filling variations, from the $35 lobster pot pie at Michael Mina to the $5 hand-held Bike Basket Pie, a homegrown quasi-street food venture that delivers cupcake-sized pies both sweet and savory to your home or office. And pot pies, that flaky-crusted savory subset, need not feature expensive filling or clever delivery. In both elevated and casual incarnations, pot pie perfection hinges on two elements: a light and buttery crust and a filling that falls somewhere between soupiness and an artless pile of meat and vegetables. Many people have strong opinions on the ideal ratio of crust-to-filling. 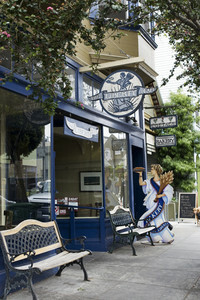 One of the city’s biggest and best concentrations of pot pies can be found on Tuesday nights at Mission Beach Café. The popular neighborhood spot offers “Pot Pie Tuesdays” that feature four specialty varieties — no chicken here. The idea was sparked by the popularity of its long-standing rabbit pot pie ($17), a satisfying combination of hearty winter vegetables, dark savory meat, and a rabbit demi-glace baked into a delicious, if unwieldy orb of crust. The special Tuesday night menu also includes Prather Ranch short rib and vegetable pot pies, but the seafood version ($26) is another standout. Unlike the rabbit, this pie features a standalone baked crust in the shape of a cup, filled post-oven with a rich seafood stew. As the price tag suggests, they don’t skimp on the crab and lobster meat. However, in the world of pot pies, San Francisco’s benchmark has long been the chicken pot pie at Liberty Café ($14). In keeping with its name, the venerable Bernal Heights spot offers a version about as classically American as you can get. Puncture the crust and the whole affair gently deflates. It’s a more delicate crust, not as buttery and hardy as other versions. The filling features carrots, peas, onions, and lots and lots of chicken. The sauce is unexpectedly dark and rich given its chicken stock base, and hits the mark on thickness. Liberty also does a vegetarian version ($13) with lentils, cauliflower, and zucchini. Not surprisingly, savory pies pop up often on menus with solid baking programs. For a more casual version, Mission Pie rounds out its roster of fruity, nut-filled sweet pies with a couple of hearty options. The Brussels sprout, apple, and bacon galette goes quickly, but the chicken pot pie ($7) is a good value and the perfect size for one person. It’s a straightforward version, served in a disposable foil tin filled with meat, green beans, carrots, onions, and more. Butter makes Mission Pie’s terrific crust off-limits for vegans, but the vegan shepherd’s pie ($7) offers a well-seasoned blend of lentils beneath a hefty layer of mashed potatoes. But for casual, portable savory pies, it’s hard to beat the selection at San Francisco’s Peasant Pies chainlet. Roughly the size of a moon pie, they run less than $3 apiece and are packed with fillings like Basque beef and potato; zucchini, mushroom, and cheese; or spicy clam and tomato sauce. The crust is utilitarian and durable, no buttery flaky pastry here. But the array of flavors is fairly large, and includes multiple veggie and vegan options, including spicy black bean and tofu, or curried potato. Peasant pies are also eminently portable; the takeaway counter doesn’t even offer forks. One is a snack, two is a meal. And with locations in the Sunset, Noe Valley, and UCSF’s Mission Bay campus, Peasant Pies is a handy spot to have in your daily orbit. 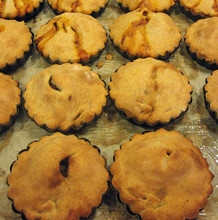 Bike Basket Pies has an orbit all its own, and anyone fortunate enough to be near mastermind Natalie Galatzer’s delivery route has access to some impeccable, seasonal, savory pies amidst her sweeter offerings. On Tuesdays and Wednesdays, Galatzer takes orders by email and pedals the streets of SoMa, the Mission, Dogpatch, and Downtown. A spinach, potato, and cheddar pie ($5) contains generous cubes of seasoned potato, rich cheddar, and just the right pique of spinach, wrapped up in a thick shortening-based crust. Her other savory flavors include sweet potato and Swiss chard, or mushroom leek “faux quiche.” You can request any item to be made vegan. For those of you who equate savory pies with grandma, Cornish miners, or the Marie Callendar’s section of the frozen food aisle, it’s time to sample the variety this city has to offer. Make a reservation for Pot Pie Tuesday, or grab a savory pie to eat on the go. Some walking might not be a bad idea when creamy fillings and buttery crusts are so ubiquitous.